This process was always accompanied by jerks and jolts due to frequent belt mistracking. The constant downtime of the conveyor belts caused delays in supply and additional costs. RWE consulted TBK Group, after which it was decided to install our CenTrax tracker rollers for a trial period. Within a month, it was already clear that CenTrax was the solution to their mistracking problem. Gert-Jan Arkema, Maintenance Engineer Bulk Handling at RWE Generation Eemshaven, explains “We use several conveyor belts at our power plant. We use a hopper to transfer the coal from one conveyor to another, but coal from the US and Russia is often damp, which means it sticks to the walls of the hopper. As a result, the load is then skewed when it reaches the conveyor belt, resulting in mistracking. The CenTrax system is a multi-roller tracker system, consisting of a central roller and a tapered tracker roller on both sides. The robust rollers are lined with 8 mm of extremely wear-resistant rubber. The rubber vulcanization process is carried out in an autoclave. This creates a permanent and seamless bond between the rubber and the steel roller shell. 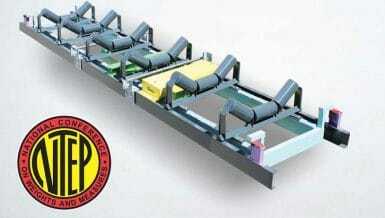 The rubber has a diamond profile, to ensures optimal contact between roller and conveyor. Even when the conveyor belt is wet, as in the case of RWE, where a wet conveyor belt is the result of damp coal. In 2015, RWE commissioned a new 1,560-megawatt capacity state-of-the-art coal-fired power plant in Eemshaven, Groningen. In the coming years, this new power plant will play an important role in Netherland’s energy supply. This is why the Dutch government, over ten years ago, designated the Maasvlakte and the area around Eemshaven as locations for new power plants. This was partly because of the proximity of a port for the supply of fuel, and the availability of sufficient cooling water. As from the second half of 2019, 15% of coal at the Eemshaven power plant will be replaced by sustainable biomass in the form of wood pellets. The replacement of coal by sustainable biomass is an important mainstay in achieving the national target of 14% renewable energy generation in the Netherlands by 2020, as stipulated in the 2013 Energy Agreement (Energieakkoord).